Much larger than rabbit with longer limbs, longer black tipped ears, and overall russet colour. Leaping stride when running fast, tail normally held down, so black and white dorsal surface visible. Unlike the rabbit the hare lives above ground and rests in a shallow depression which it makes in the soil. This is called a form. It is most commonly found in arable areas where cereal growing predominates. It prefers cultivated land (wheat, sugar beet, peas) to pasture, set aside and woodland although the latter areas are used for resting , particularly in winter. In Kent hares are most commonly found on the Isle of Grain, the Isle of Sheppey, on the dip slopes of the North Downs south of Sittingbourne, and on Romney Marsh. There are occasional sightings across the remainder of rural Kent excepting the High and Low Weald where they rare. 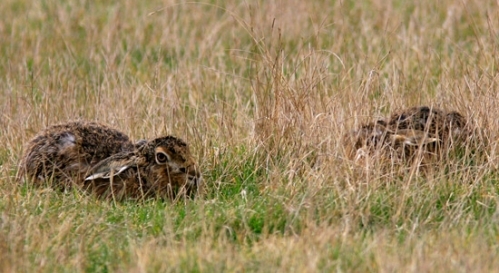 Hares are mainly nocturnal and tend to lie low in their forms or in cover during the day. They are seen more in the spring at the height of the breeding season when groups of hares run in circles and may box with each other. The latter occurs when a jill hare fights off the unwanted attention of a jack. They are best seen by walking the fields where distant hares may appear as low lopsided mounds. Equally, they may be so well camouflaged that they are not seen until they spring from their forms at close quarters. 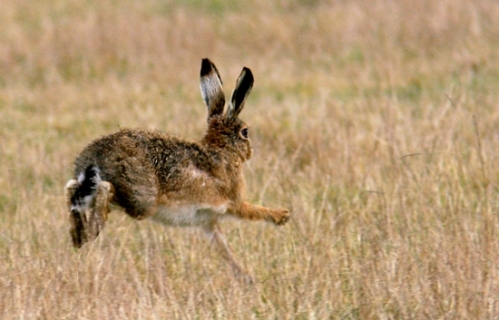 Regrettably, illegal hare coursing is a problem in Kent so, if field walking it is important to stay on rights of way, or to obtain the prior permission of the landowner to roam. With justification farmers tend to treat any one walking in hare habitat with suspicion and Kent Police have operational plans to respond in force if coursers are identified. Do not use a lamp at night without ensuring that the landowners and police are given prior notice. 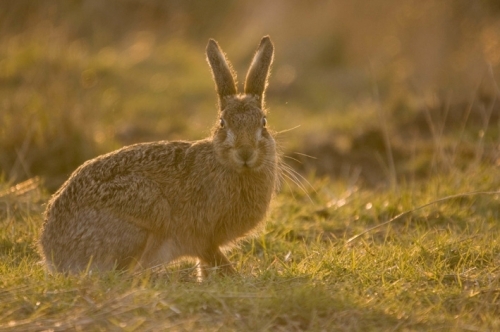 In Kent the only other animal that might be confused with the brown hare is the rabbit. Although from a distance they may appear similar their respective habits are quite different. The brown hare is a larger, longer eared, more solitary animal that usually grazes or lies low out in the middle of a large open field. When disturbed it will hop off on its long legs, quickly accelerating into a run that rapidly takes it into the distance. With its tail held down little of the white underside is visible. Rabbits usually graze in groups around the margins of fields or within easy range of safety. When disturbed they will run fast for cover showing the underside of their white tails. With their relatively short legs they appear to run low to the ground. The hare’s main predator is the fox. At one time fox numbers were kept low by game keepers, and they protected hares so that they could be shot or coursed. 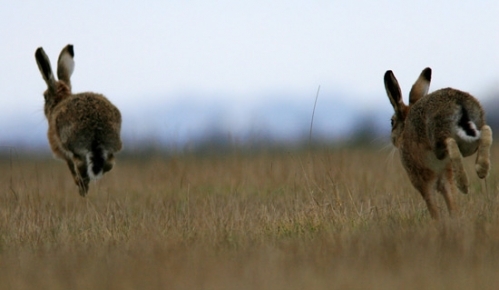 It may be that one reason for the decline in hare numbers is the increase in the fox population. Despite concerns about the loss of of the hare from the countryside it remains a game species and many are still killed at organised shoots. The stoat, mink and badger are also predators. Young hares are particularly vulnerable to predation and since the intensification of farming, are also at great risk from machinery and pesticides. Hares are also killed by coursing dogs, on the roads, and are susceptible to a number of diseases and occasional epidemics.